Alan Richards: I wrote this a few years ago after one of our motor-cycling holidays up to Mallaig….. The thoughts of the long and somewhat arduous journey up had receeded to the back of my mind by now as the midday sun began to warm our faces. We were just over half an hour out from Fort William. Last night had seen us early to bed after a few pints of ‘eighty shilling’ in the ‘Ben Nevis’, early doors. We’d been cold and hungry when we’d ridden into town. The winds across Rannoch moor and Glencoe were testing the bike’s stability and the rain was incessant. Sue had a tie-dye scarf wrapped around her face and when we dismounted to price up the Bed & Breakfast’s the colours had transferred to her cheeks! No matter, the first digs we tried was welcoming enough and quite palatial really. At fifteen quid each for a place to lay your heads and a ‘full Scottish’ we considered this a good result and just reward for the marathon run up from Manchester in worsening weather. As we lay in bed pre-sleep, the t.v. weather forecast promised a warmer and sunnier agenda for the new day. It wasn’t to be proved wrong. Memories of holidays past entered my head as we ran under the viaduct at Loch Nan Uame. the sun was glinting off the blue waters. The bikes engine rumbled reassuringly as I climbed the hill in fourth, the views to our left were beginning to invigorate as they always do. We knew the few miles of wooded road up ahead would be a joy. Mostly single track with passing places under a canopy of leaves and boughs, the burble of the old 650 would resonate handsomely as we twisted our way westward. 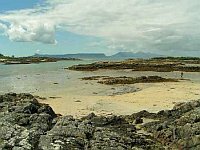 As Arisaig neared, we decided to forego the pleasures of the brand new road and let the ‘XS’ have it’s head on the old meandering coastal track. We veered off to run through the village, a minibus on the car-park, several of its passengers entering the Spar grocers and the Cafe Rhu. We did not linger just climbed away past the church and headed for the Cnoc-na-ffaire pub, which we knew we’d be patronising later in the holiday. The views now were becoming familiarly stunning. 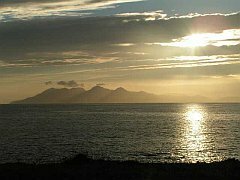 The sun high in the sky with just a few cotton wool puffs of cloud over Eigg & Rum, those twin jewels sat, seemingly side by side off the shore. Glints of light dancing off the water as birds in their hundreds wheeled and circled above and at water level. The sand of Traigh beach and those rocky outcrops almost deserted, yet even more inviting for all that. A couple of children explored a rock pool with nets in hand. We pulled over and I kicked the sidestand down, Sue dismounted and stood, transfixed at the panorama she never tires of. This was one of those times we regret giving up smoking. A contemplative fag, as we took all this beauty in would have been just right for the moment. Never mind, our lungs might thank us for it in years to come. A couple of golfers played a hole behind us, and the gentle breeze wafted those clouds ever so gently eastward. Sue looked for life on the waterline, a seal maybe? Or is it a piece of rock, it’s so hard to be precise when the mind is willing wild life into view. Remounting we followed the twisty and narrow track past Camusdarrach and rejoined the new road . 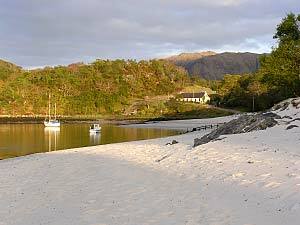 Surveying those silver sands at Morar. befitting any Caribbean island you could mention yet even more beautiful – and no Coconuts to worry about, although having helmets, this need not have concerned us. Dropping down the hill into Mallaig and opening the throttle. Only us on the road as we crested the final ascent at seventy mph. The pulsating throb of a hard working engine felt through those wide handlebars as we glanced westward to the Sound of Sleat and Skye’s Armadale peninsula. Approaching Mallaig we became aware of the presence of the ‘Jacobite’ to our right, the old train in steam as she neared her destination – Mallaig. Her daily return trip almost half over, the four coaches she was pulling well stuffed with trippers and holidaymakers. Sue offered a gloved wave and was rewarded handsomely as several of our fellow travellers returned the gesture. What is it about this part of Scotland that brings out the best in people? I don’t know. Can it be the stunning views or the timeless, easy going pace of life here. Perhaps those unforgettable sunsets, as the light falls behind the inner Hebrides, on a good night the sky is on fire and the clouds aglow. In June it goes on and on and is not really dark until almost midnight.Sit and savour with a bottle of red wine handy. Whatever it is it works for us. I’d guarantee it would work for you too! However you travel, make the journey. If you do it once, I guarantee you’ll do it twice! By road or rail, the road to isles is the freedom road or the glory road, it’s all their for the taking on the A830. Of course, if you cannot be bothered then buy the dvd of ‘Local Hero‘ if you can find a copy and savour the beach scenes.